A father’s love is the secret ingredient inside My Green Mattress’ products. Designed by a doting dad (and founder of the company) the Hope bed is designed with allergy sufferers in mind. The founder, Tim Masters’, daughter suffers from allergies and eczema, inspiring her father to create a line of products meant to ease these symptoms. This overview of the My Green Mattress Hope bed will take a close look at the bed’s design and construction, along with its key features and how it compares to other items on the market. We’ll also provide scores and suggestions as to who should be best-served by this bed. Keep reading to find out all of Hope’s ins and outs. Or scroll to the end to find our scores and overall impression. Like a firm bed – This product runs a little on the firmer side. This should be ideal to exclusive stomach sleepers or back sleepers who prefer firm support. Want an organic product – All of the materials are certified to be made of mostly organic properties. This bed also features certifications promising low levels of chemicals and other additives. Like a gentle cradle with bounce – Shoppers should float more on than sink into the latex. They may notice a gentle contouring effect and good bounce that should prevent any difficulties in moving around and changing position. Are an exclusive side sleeper – Some side sleepers might prefer a softer comfort level to reduce pressure in the hips and shoulders, and Hope may be a little too firm to suit these needs. Stomach sleepers or anyone preferring more ample support should appreciate this comfort feel. Hope is a latex product that is shipped compressed inside a box. This product can be used on any flat, supportive surface, including the floor. The company recommends that if a slatted base is used, the slats are no more than 3 inches apart to provide ample support to prevent sagging. The cover is comprised of certified organic cotton and temperature-regulating wool. The cover is quilted to promote a plush comfort experience. This item is 8 inches tall. The first layer holds 2 inches of Dunlop Latex that should provide a soft and comfortable feel. This should provide lumbar support, as well. The second layer contains a 3-inch medium-firm Dunlop Latex layer. This is designed to contour to the body and to compress or pushback depending on your weight and position. The third layer consists of 3 inches of Dunlop Latex that should feel firm. This final material is meant to provide stability to the bed. 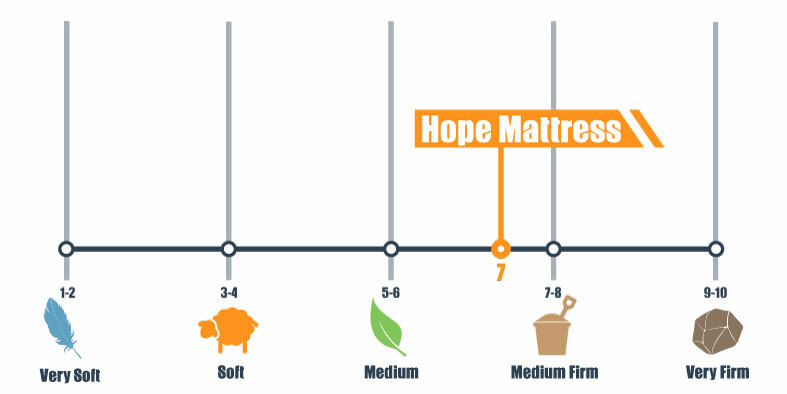 Hope has a score of 7 on our comfort scale, which uses a system of 1-10 to determine the feel and firmness of each product. Using this system, 1 would be the softest score an item could receive and 10 would be the firmest. Most shoppers should find this comfort level to feel medium-firm to firm depending on their weight and body shape. There should be minimal sinkage present, resulting in a gentle cradle. 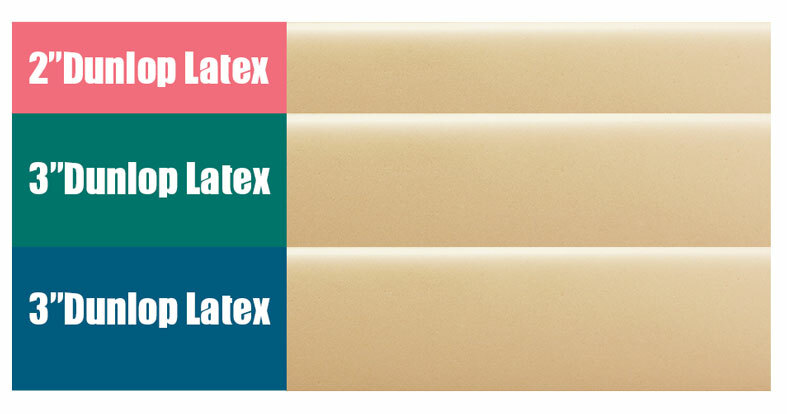 The latex in this bed is meant to contour slightly, especially in the lumbar region, to promote good spinal alignment. The materials should provide airflow and temperature regulation to prevent overheating. The materials in this bed should respond quickly, reclaiming their shape easily to reduce body impressions. Shoppers should notice good bounce that should push sleepers toward the surface. This should allow combination sleepers to easily move around throughout the night. Stomach sleepers often prefer a firmer feel to prevent the hips from sinking. Most should find this item provides ample support in this area and should be quite comfortable. Back sleepers who like a firmer comfort option should enjoy this bed. The foams are designed to contour to the lumbar region, which should provide proper spinal alignment and even weight distribution. Some side sleepers may prefer a softer product to reduce pressure buildup in the shoulders or hips. Feel is largely subjective and dependant on the shopper’s personal preferences, but if a plush comfort feel and enhanced pressure relief are very important to you, you might want to consider a softer option. There is no specific weight limit for this company’s products. While this bed is on the slim side, at only 8 inches tall, it should be firm enough to support heavier sleepers. Those wanting more enhanced support may look at the thicker hybrid Natural Escape that has zoning for spine alignment. The latex in this mattress is quite springy and provides good bounce. While the layers are denser than an innerspring’s materials, you may still notice more motion transfer than in classic memory foam. The end result should be less motion transfer than a traditional innerspring, which should allow all but the most exceptionally light sleepers to rest peacefully with reduced disruptions. Shoppers should experience good edge support when lying along the edge of this bed, especially when compared to most all-foam products. Because the latex in this item is somewhat firmer, it should pressback fairly well, preventing too much compression from forming when buyers are lying down. This should be a benefit to couples and co-sleepers or people who like to hug the edges when sleeping. Trial Period – Shoppers may exchange or return their purchase once within the 100-night trial period. Warranty – The company offers a 10-year warranty. Shipping – Shipping is free to the continental United States. An additional fee is required for orders shipping to Alaska, Hawaii, or Canada. OEKO-TEX® Certified – The latex and wool in this product are certified to have low levels of chemicals like formaldehyde or heavy metals like nickel or lead. GREENGUARD Gold Certified – This item is certified to contain low levels of VOC emissions and is considered safe for children to use. GOLS Certified Organic – The latex used in this bed is certified to be at least 95 percent organic. GOTS Certified Organic – The cotton in this bed’s cover is certified to contain mostly organic materials. Back and stomach sleepers should be satisfied with this medium-firm to firm latex bed that utilizes antimicrobial, organic materials. 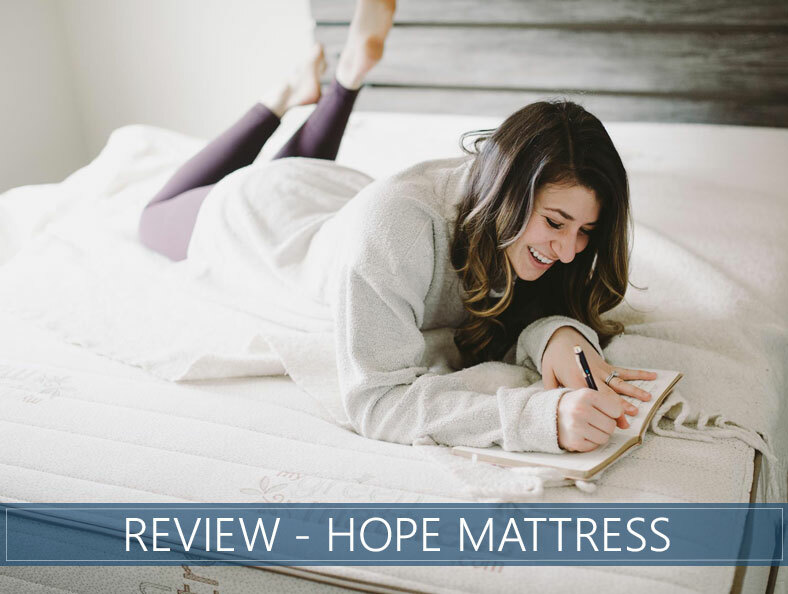 Shoppers sinking minimal sinkage, lumbar support, and a firm feel should enjoy the Hope Latex bed. Certified organic materials promise a soothing experience for allergy sufferers. Bounce, responsive foams, and good airflow should promote temperature regulation and easy repositioning. Are You Allergic to Latex Beds? – What Are The Symptoms?